The bus from San Salvador to Guatemala City is a brilliant thing. Comfy, wifi and easy border crossing, this is definitely recommended if you’re going to make the trip. 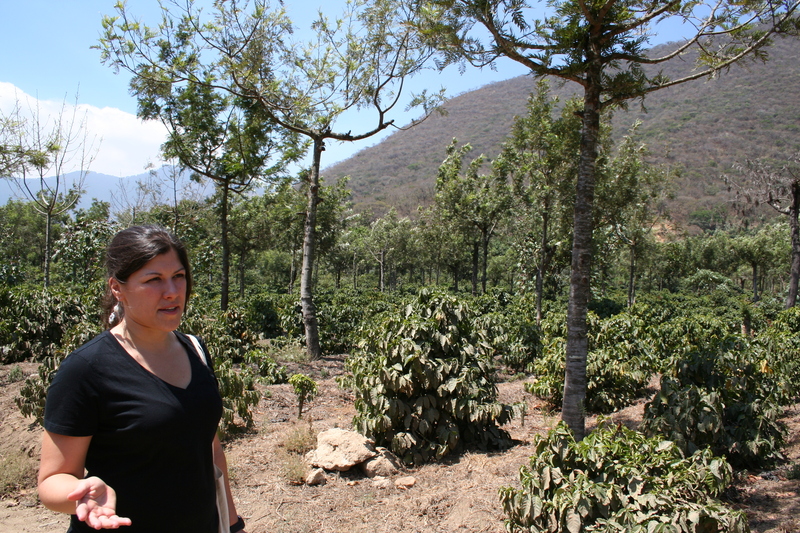 With the final destination being Antigua I was picked up by Marta and Colomba Dalton of Coffee Bird, and driven to their family estate, the big and beautiful Finca Filadelfia. The various plots within the estate are owned by Martas grandfather, uncles and aunts, such as the Bosques de San Francisco (grandpa Dalton’s plot) which some of you will remember from last season. 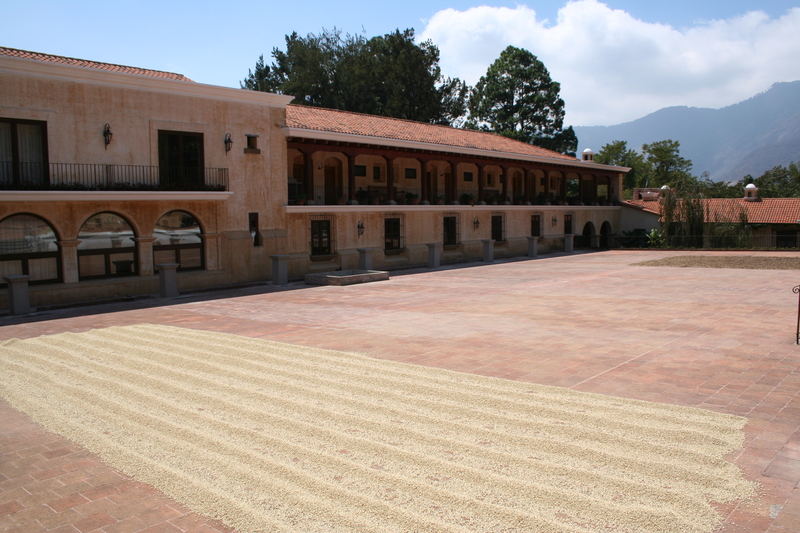 On the property they also mill, roast and give educational farm tours as a part of their events and boutique hotel service. We spent some time walking the farm, seeing the stark differences between some of the plots that were sprayed for roja and those that were not. On one side of a given road you had beautiful, strong and healthy plants full of foliage, while on the other side of the road there would be nothing but bare branches, a ghostly spread of trees that had no chance against the devastating disease. 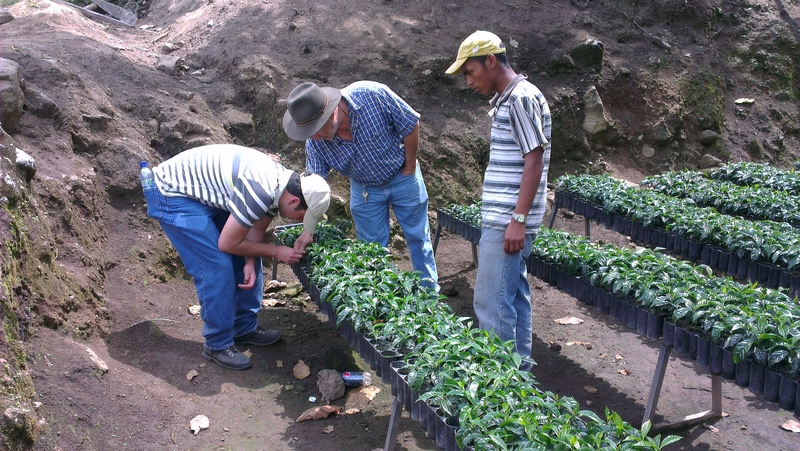 Some experiments with ‘injerto’; grafting arabica stems onto robusta roots, were taking place in the nursery, just like I saw in El Salvador. Picking was nearly over but some areas were still carrying cherry. 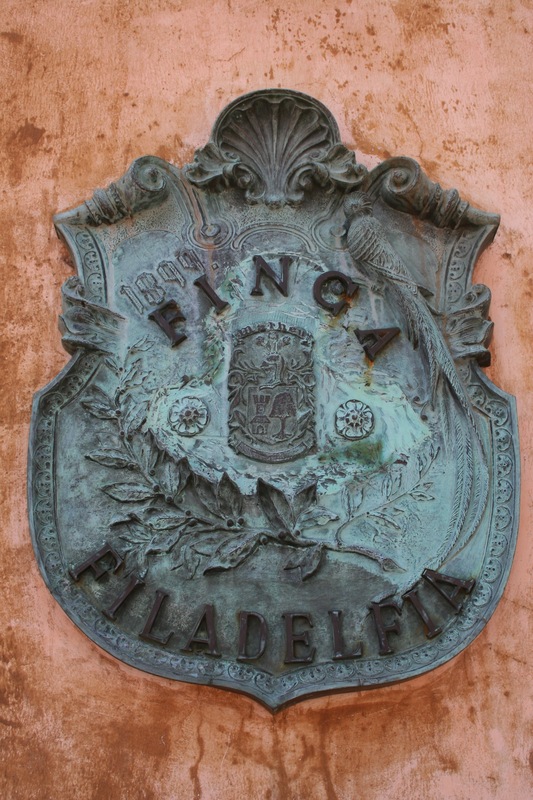 There are 65 permantent workers at Filadelfia, but during harvest they bring in about 200 people to help. I like having the chance to roast my own samples when I’m traveling, so I can taste the coffees at a roast level that best allows me to find what I’m looking for. The lab at Filadelfia is big and well equipped, so I spent some time on the sample roaster trying to work out how to dial in the greens we were looking at. It can be tricky working with very fresh samples, but I was happy with what I could get out of them and just a few days ago we finalized the short list of which coffees we’ll bring in this year. 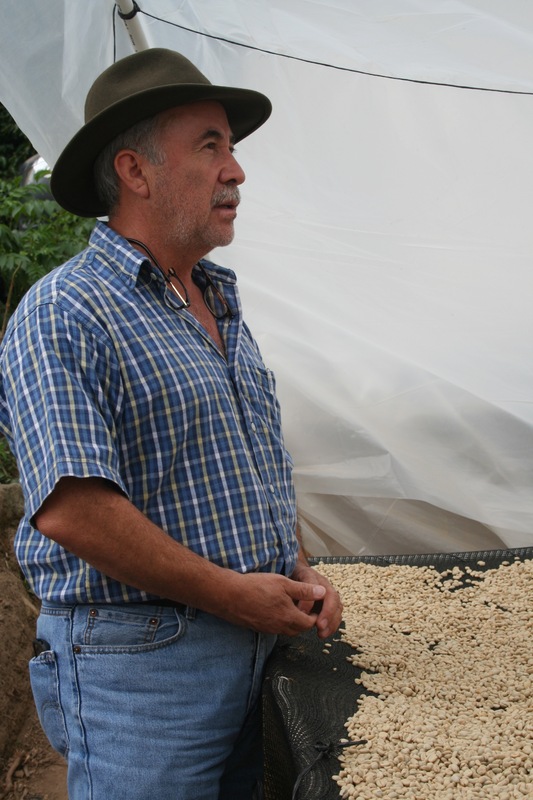 While in Antigua I also took the opportunity to revisit the Bella Vista Mill, meeting up with Luis Pedro Zelaya who gave a quick tour of some of the new facilities they’d built since my last visit, and put on a full table of samples to cup. Like I was to see in many places across my trip, they have built new three tier moveable african drying beds inside a greenhouse structure, nearly tripling the amount of space they would have compared to patio. 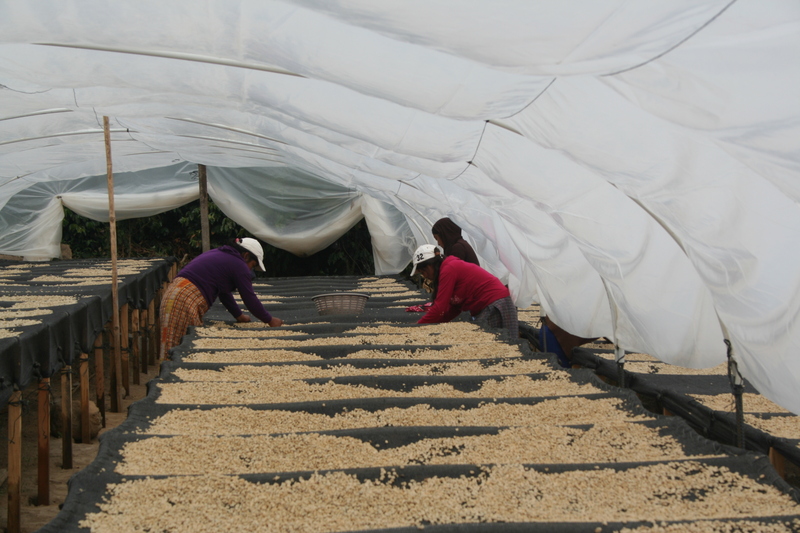 The coffee stays clean and protected from the elements, the drying is gentle, and as the parchment dries it’s moved up the tiers. While this good size mill has 14 fermentation tanks, they are also making some experiments for new ways of utilizing tanks for small lot separation. They wetmill for about 30-40 farms, and drymill for even more. While we were cupping the sun went down, but the receiving station was still in operation. A truck with bags of cherry pulled up, and as the guys unloaded the sacks, handfulls of coffee were sampled from each bag and given to a girl sat on the side for inspection. 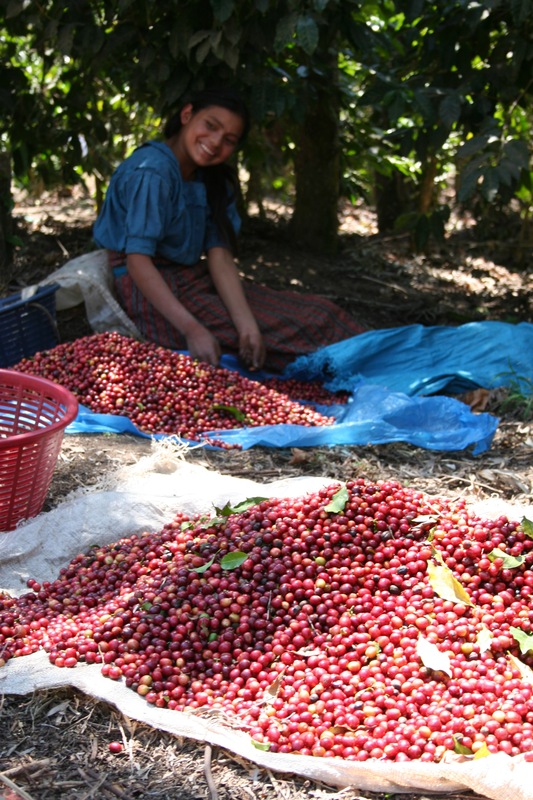 Based on how many underripe, ripe and overripe cherries she sorted from the sample, she recorded the numbers and calculated how much the mill would pay. If she counts more than 80% ripe, they pay 5 GTQ more than the street value, and for 95% ripe and up they pay up to 30 GTQ more. There is also a premium paid if the coffee is all Bourbon. 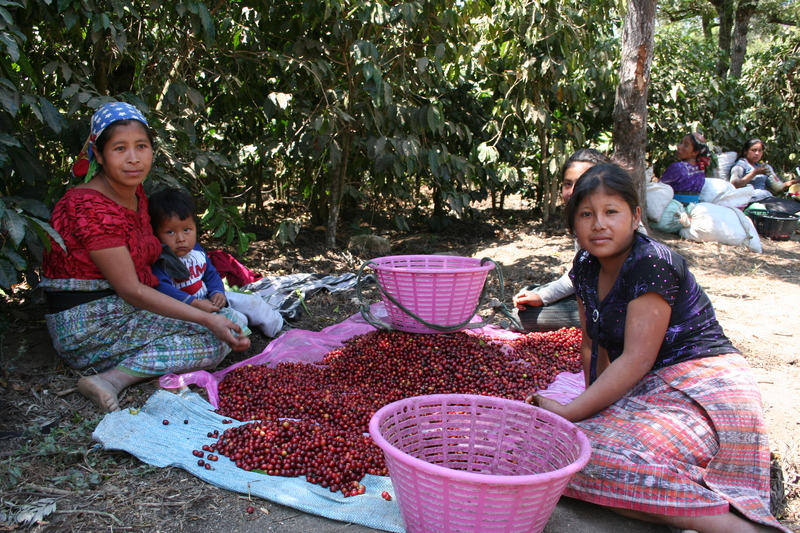 This way they encourage not just the highest quality but also the separation of small lots, to meet the increasing demand from specialty roasters like us. I was also able to go back the the Serben mill and cup with the exporters at Servex, the same crew who processes all of the Cup Of Excellence lots in Guatemala. 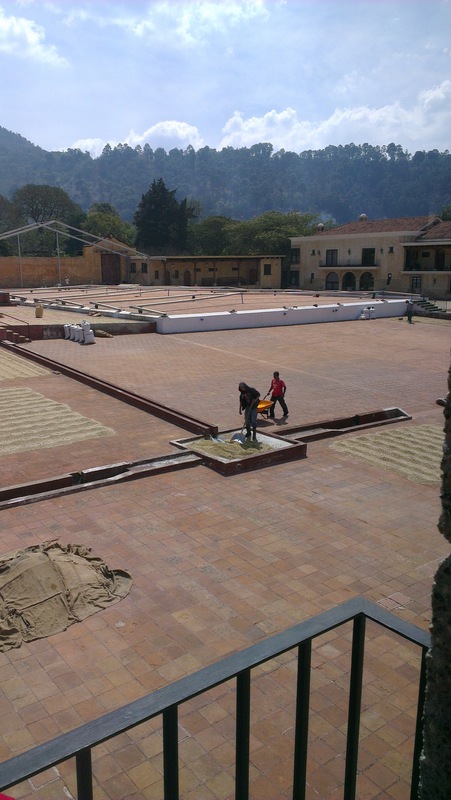 Genaro and his team are in the middle of planning and constructing new warehouses and and a new roastery for their own local roasted coffee brand, which will house their two beautiful vintage Proabat roasters. In the cupping lab it was great to catch up with Arturo Aguirre Jr. from Injerto and Renardo Ovalle from La Bolsa, who had their coffees on the table to check on the quality of their crops. 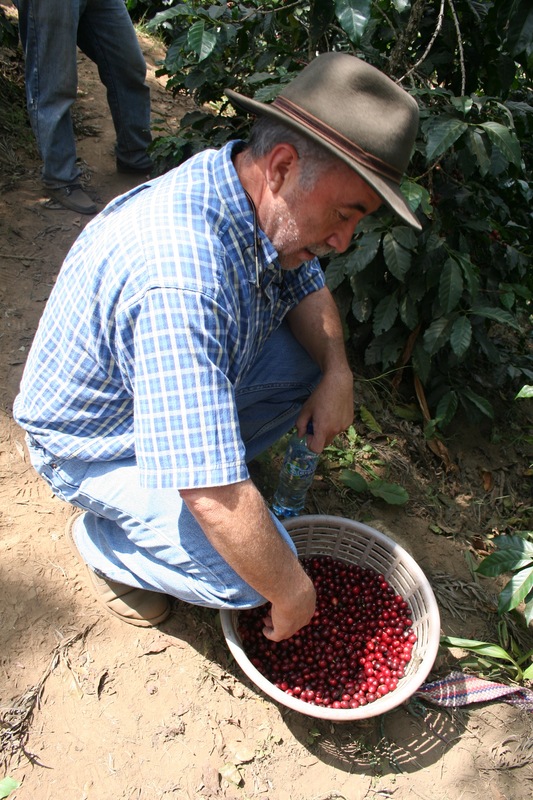 I was happy to find some firm favourites, and will soon be cupping some more to decide on lots for purchase. 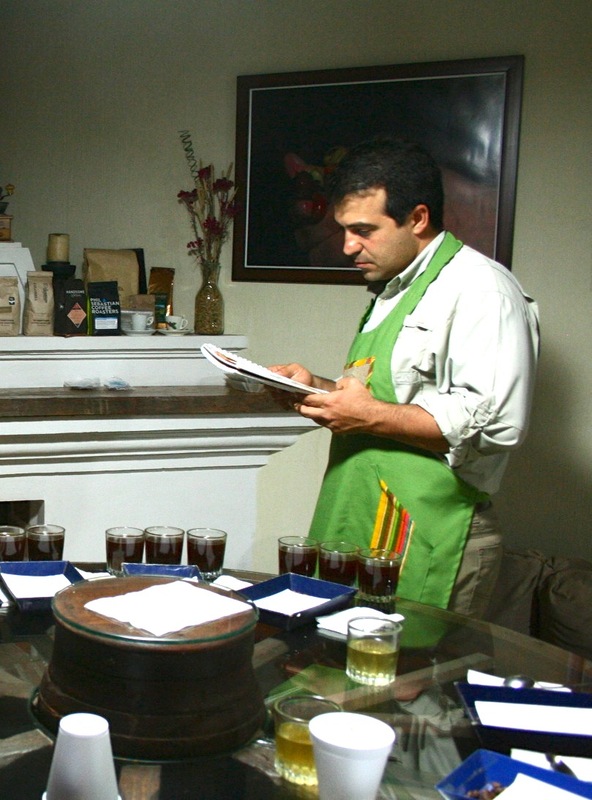 The last cupping before we headed to Huehuetenango was at Anacafe’s offices in Guatemala City. It was nice to see a couple of familiar faces in the lab, and here too I cupped some great samples. Encouraged by the prospect of visiting some of these farms in Huehue, the 5am start and 7 hour drive to get there would be a bit less insufferable. Still, the roadworks and speed bumps every hundred metres quickly get very, very annoying. Since La Bolsa, the first farm we were headed to, is actually only about 15 kilometer from the border, I think I’ll fly into Mexico next time and drive across! You can actually see the very straight lined tree-less band that is the border as you drive to the farm, it cuts across the mountains at almost comical angles. No following the natural shapes of the landscape here. La Bolsa belongs to Renardo Ovalle who I have known for years, but this was my first visit to the farm. Unfortunately he had to stay in Guatemala City so couldn’t be there, but we had a chance to chat over dinner the night before the drive. The first thing I heard when I got there was laughter coming from the school, and the sound of flutes from the coffee fields. While they work, the pickers leave their kids in the care of the school staff, and currently they’re looking after about 30 children. They’re taught both theory and practical skills, implementing their knowledge by learning about things like baking and food safety, basketweaving and piñata making. Some of the children are still too young for the school! The flute sounds from the coffee fields is how the pickers communicate with each other, telling each other which rows to pick and where to go next. 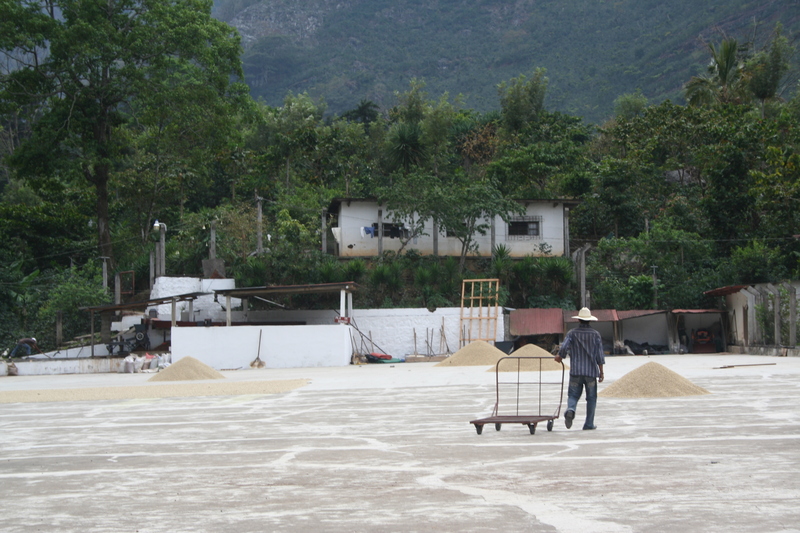 The farm forms a sort of horseshoe at the end of a valley, and gets limited hours of sunshine leading to a fairly slow maturation of the cherry and slow drying. 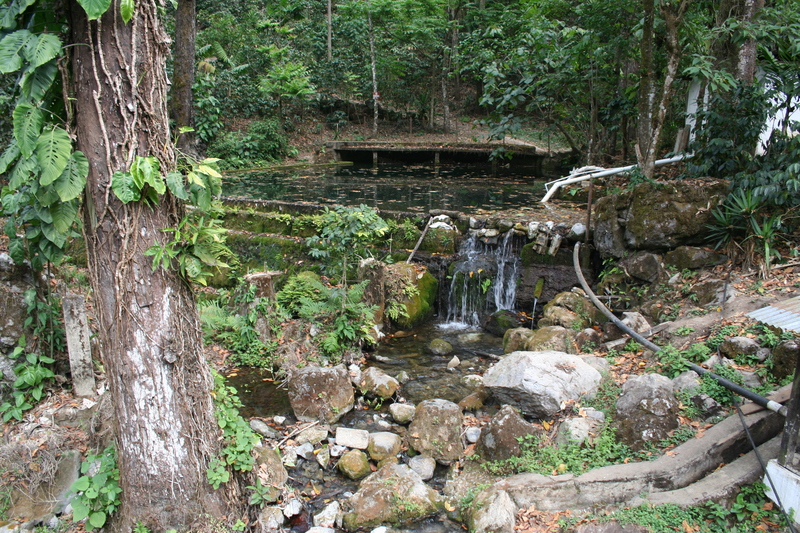 They have their own spring coming out of the steep mountain side, and have built an extensive aqueduct system to ferry this water around the land. 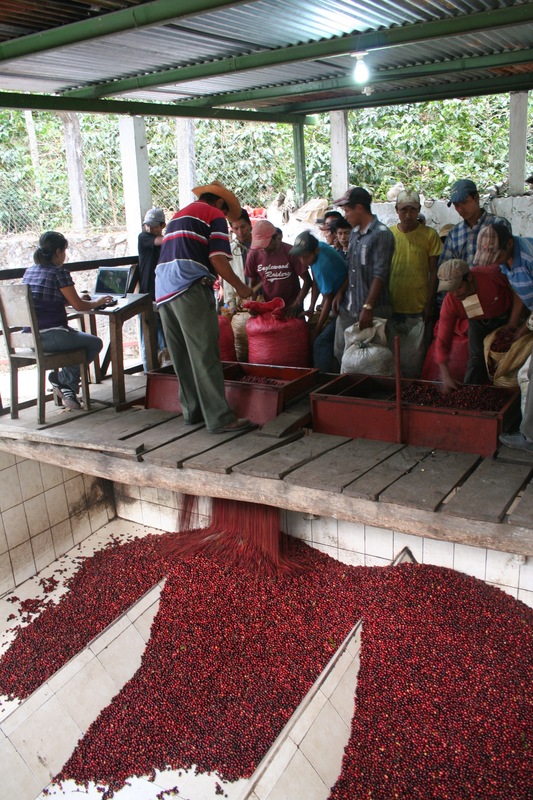 The channels act as density sorting points as well, carrying cherry and parchment to their respective mills and patios. The higher grown, prime cherry normally spends 36 hours in the fermentation tanks, 12 hours in post soak, and up to 25 days on the patios. They also use mechanical driers for some of the coffee that grows down at 12-1400 masl. Mercedes, the 24 year old agriculture student that guided us around, took us on a hike of some the 11 plots that make up La Bolsa: Isla, Zacatonal, Huerta, Injertal, Ventana Grande, Ventana Chica, Encuentros, Cabro, Jocotillo, Frijola I and Frijola II. 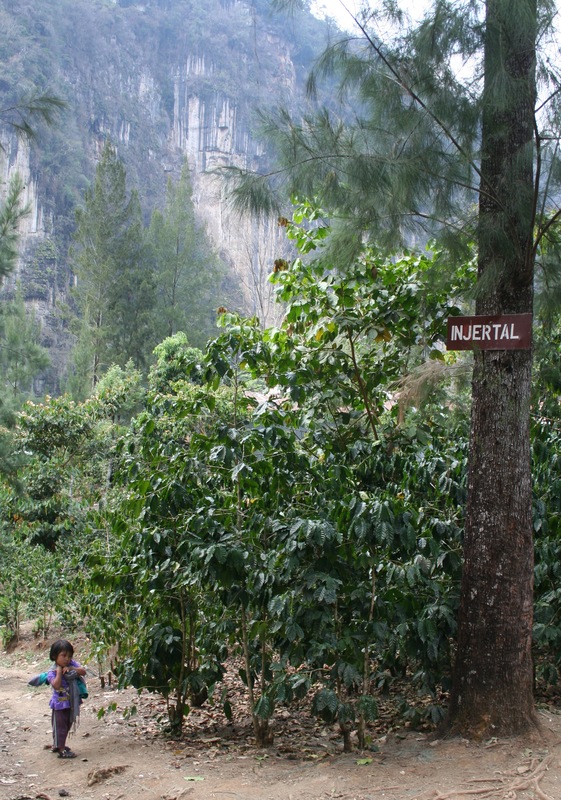 The terrain is very steep, and as we climbed we could see how the lower grown trees were less affected by roja then the higher ones, aligning with the impression from El Salvador that the disease is getting more hardy. Back down on the mill site, the pickers were bringing in the day’s harvest, and we got to see how they track the logistics of everything that comes in. 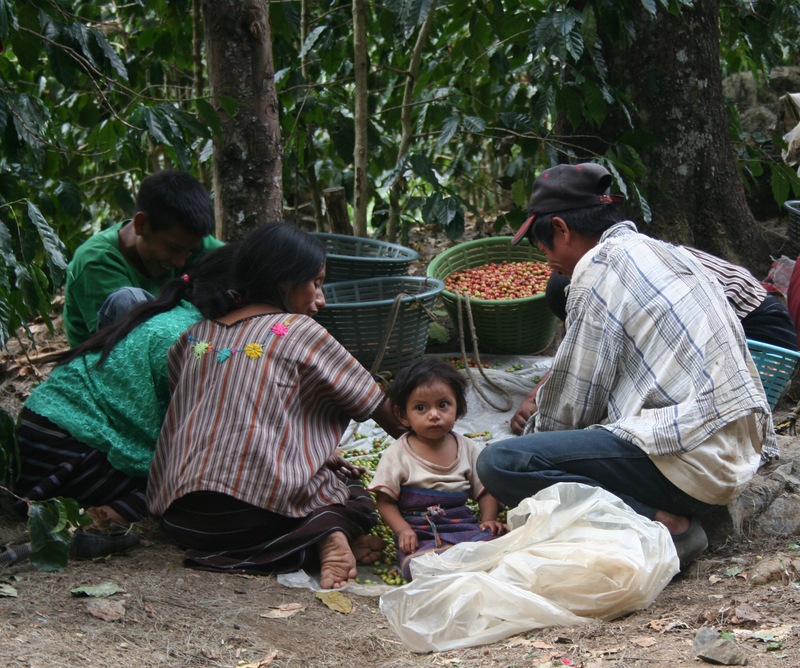 The pickers here are paid by volume, measured in cajas. 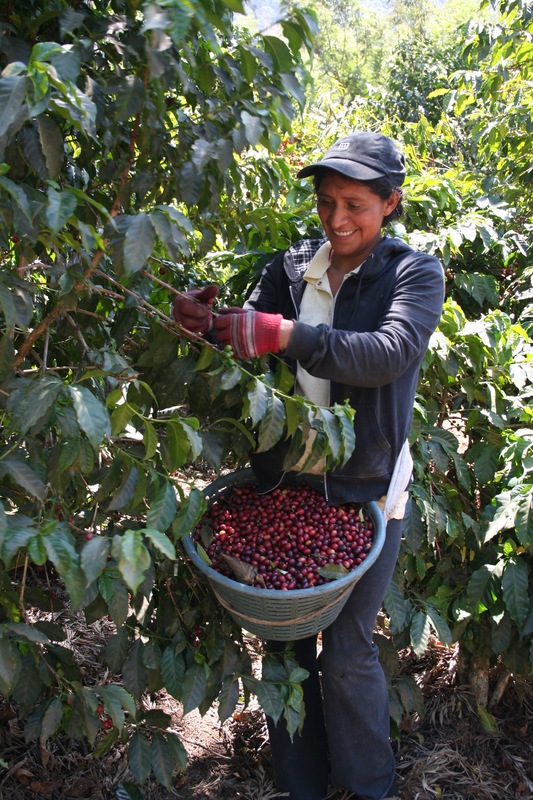 1 caja is 45 quintales or about 100lb cherry, and they normally pick 2.5-3 cajas per day. 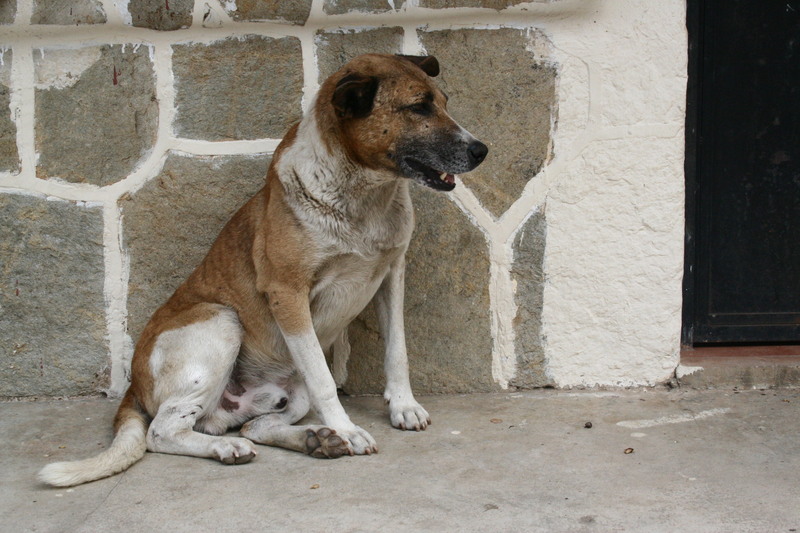 For this they earn around 16-17 USD daily. 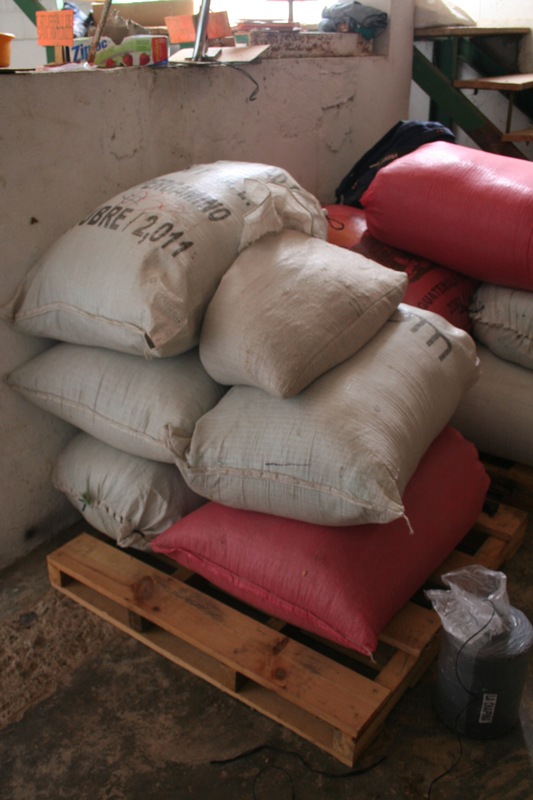 After they are emptied, the bags are washed in clean water, hung up to dry and ready to be filled again the next day. 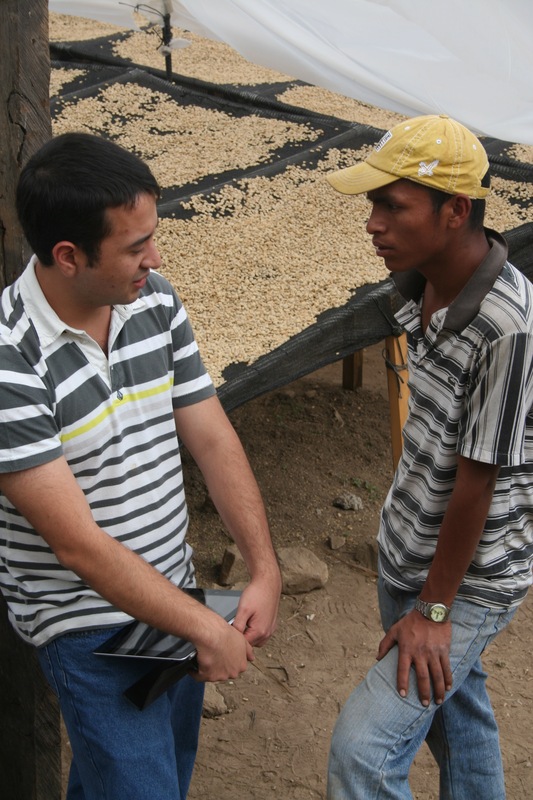 The last farm I had time to visit was one of the farms from the cupping at Anacafe, called San Antonio Chaguite. 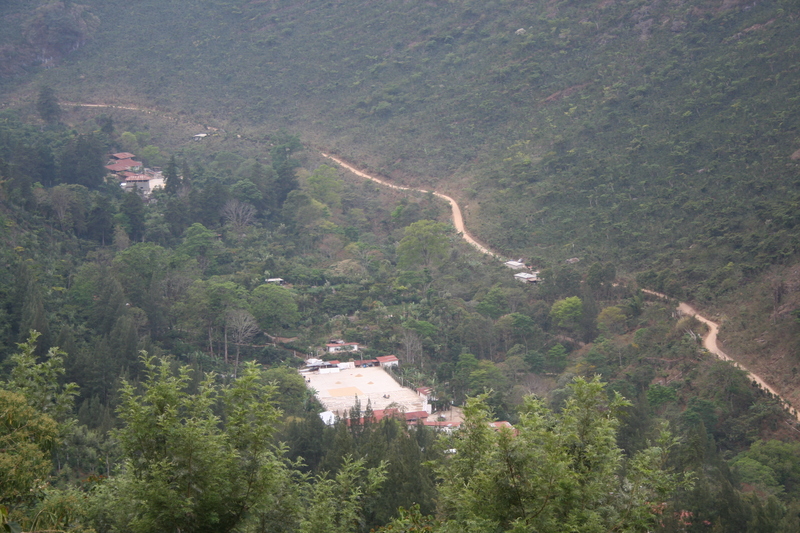 Way off the main road, the 27 km long bumpy dirt road to the Finca took two hours to complete. Back when Williams grandfather owned the farm, the trip to get cherry down to the nearest mill would take 20-25 days to complete, by mule. It sounds gruelling, but one good thing that came out of it was the chance to stop over and woo Williams grandmother in one of the villages along the way. We might be making great time cruising along in a Toyota 4×4, but no one gets engaged under those conditions. My favourite lot, only 5.5 bags of parchment! Hope I can afford it! At 18-2100 masl, this is one of the highest farms I’ve been to, and the elevation means they are only a quarter of the way through harvest when most everyone else is wrapping it up. 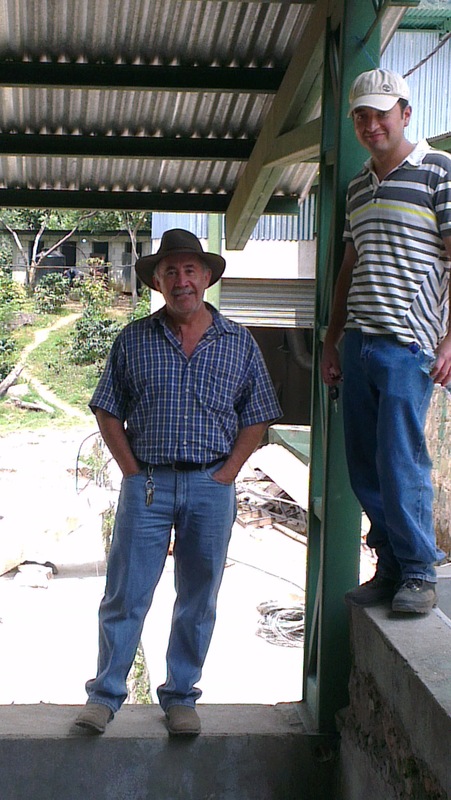 Owner William Perez and his son Guillermo took us on a walk around the estate, which is divided into 4 farms: Los Pinitos, Las Americas , El Moreno and La Cascada. The ripening looked nice and even, a good sign. Mostly clear of rust, there were still a few trees that had been hit by antragnosis, being dried out from the cherry to the trunk. But other parts were full of trees so heavy with cherry the branches had to be propped up and supported not to snap off. 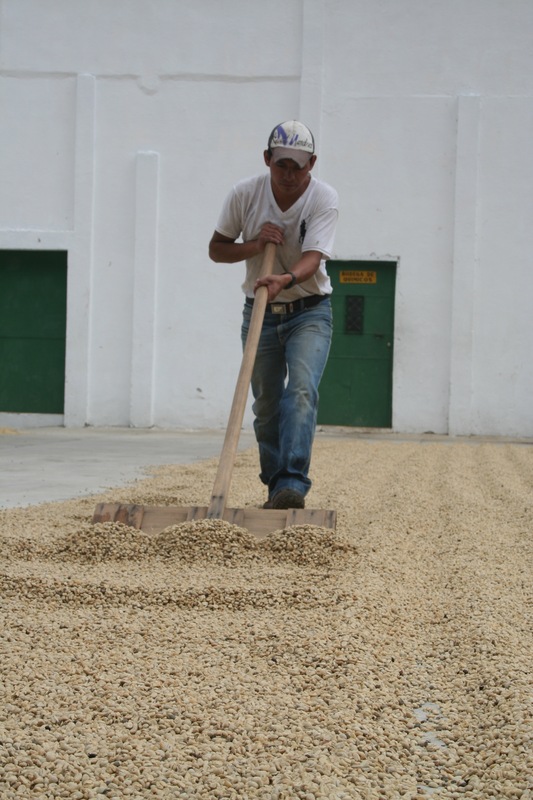 At El Moreno, they’re building a new wetmill and setting up new driers, and wanting to experiment more with drying times, resting the parchment and finding ways of improving the quality across the board. 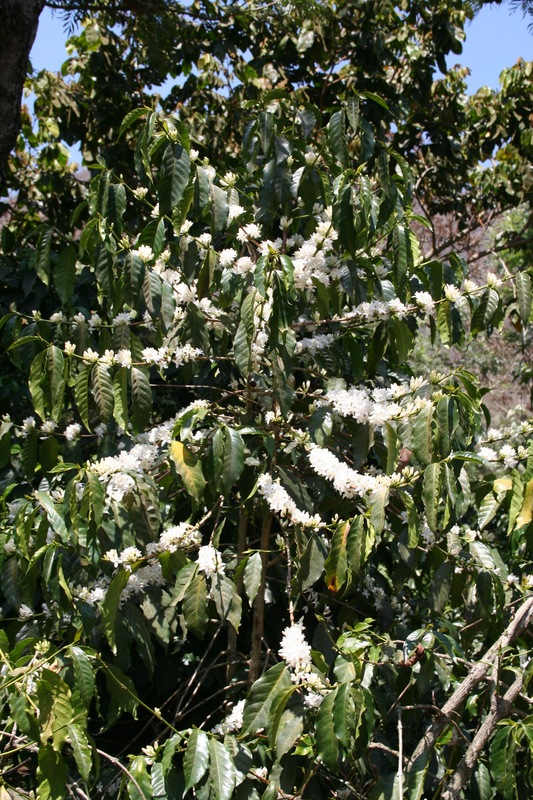 El Moreno is also the site of the nursery, where besides their normal stock of Caturra, Bourbon and a little Pacamara, they are experimenting with more rust resistant trees intended for the more humid areas of the estate. Although still early in their harvest, I’m excited about the samples I’ve seen so far and look forward to the ones coming out of the peak of the crop.